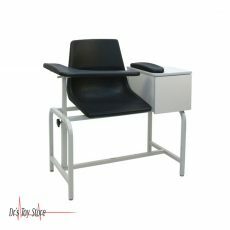 The lower blood drawing chairs is also referred to as a phlebotomy chair. This is a specialized medical room chair that allows the patient to sit comfortably to allow the medical staff to take blood samples or draw blood for blood drive collections. 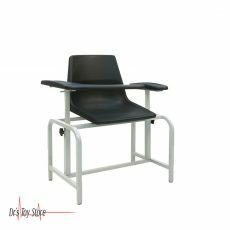 Phlebotomy chairs are commonly found and used in medical facilities such as hospitals, doctor’s office, nursing homes, and clinics. Meer looking at blood draw chair for the first time, they can look like ordinary chairs with shaped plastic or upholstered seats. Some even look like conventional recliners. They have secure four-point stability bases. 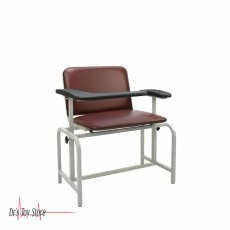 However, blood draw chairs have one or two armrests that can be raised upright or tilted to the side to allow the patient easy access to the seat. There are three functions performed by the armrests. First, the patient’s arm is comfortably supported during preparation for and during venipuncture. Secondly, phlebotomist has a stable place for putting vials, alcohol stains and other necessary equipment until the need arise. Third, if the patient begins to feel weak or fall, the armrest will provide support; this prevents the patient from falling on the floor. While some models are fixed in height, other blood draws chairs can be adjusted in order to make the medical technician comfortable. Models with an electric or hydraulic engine for lifting and lowering the seats are also available. Several model designs provide drawers at the foot of the chair or additional to hold stock at hand. 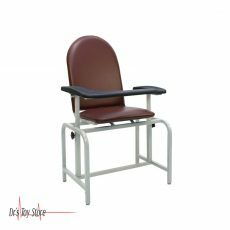 Other format options include extra-wide chairs for bariatric patients, formations with child-friendly graphics for use by pediatric patients, or free-standing armrests for patients who may not be able to be easily seated in the chairs such as those who use mobility devices. The patient is seated and, if necessary, the clinician adjusts the height of the chair and the swing or folds the armrest to its normal position. The arm of the patient will be placed on the rest and the clinician organizes the necessary supplies on the remaining part of the rest. Next, the clinician finds a suitable vein, cleanses the area and carries out the venipuncture, collecting the sample in a vial. When the appropriate amount of blood is collected, the clinician stops the bleeding by pressing the site with the gauze and an adhesive bandage, then completes all forms and sends it to the lab. Why are Blood Drawing Chairs Used? They provide a stable and comfortable resting place for the patient while giving a blood sample, both for anxiety relief and for reducing the risk of injury associated with the blood draw. For the clinician, blood draws chairs provides easy and safe access to the patient’s vein while simultaneously reducing the risk of injury due to body mismatch or accidental puncture of the needle. Clinical facilities also benefit. The risk of accidents at work due to injury to the back or mouth injury, as well as reduced risk of injury to the patient, greatly benefits a facility’s bottom line. Who Uses Blood Drawing Chairs? Any clinician capable of taking blood samples from patients can use them. 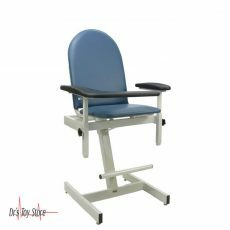 Blood draw chairs can be used for every patient ranging from infants who can sit up to the elderly and everyone in between this two set of people. For smaller patients, special blood draw chairs are available. Blood work is used to diagnose many conditions including cardiovascular diseases, diabetes, and cancer that affect the lives of patients of all ages. It is also used to monitor drug levels in conditions such as bipolar disorder to ensure that the dosage fits into therapeutic guidelines. Where are blood draw chairs used? They are used in hospitals, clinics, doctors’ offices, and residential care institutions such as nursing homes. Some are also suitable for use in blood donation centers.